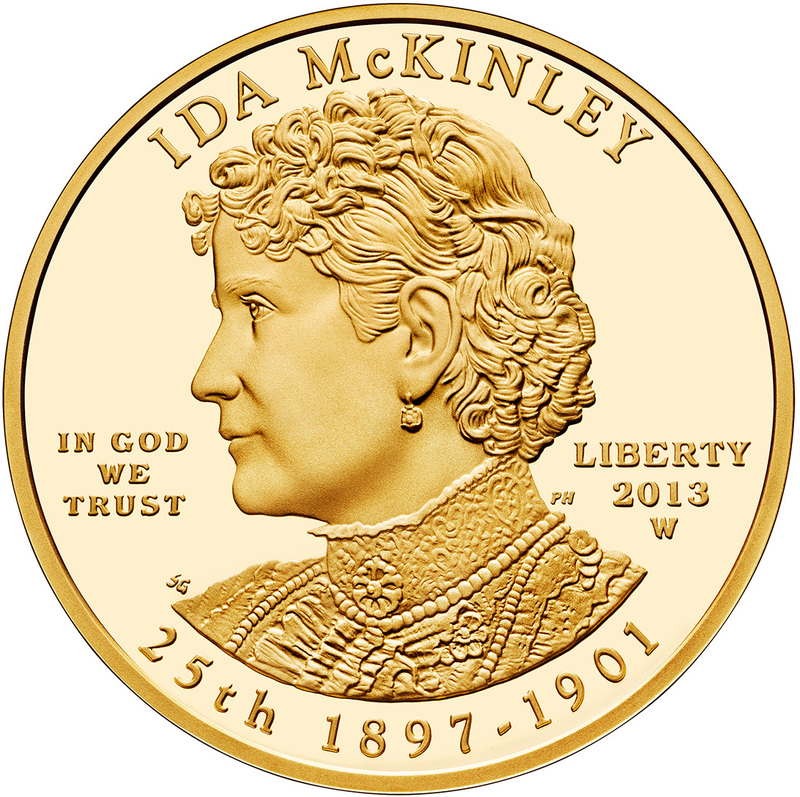 Available beginning today, November 14, 2013, the United States Mint will make available for purchase the 2013 Ida McKinley First Spouse Gold Coins. Each of these coins features an obverse portrait of Ida McKinley, wife of the 25th US President William McKinley, and a reverse design emblematic of her life. 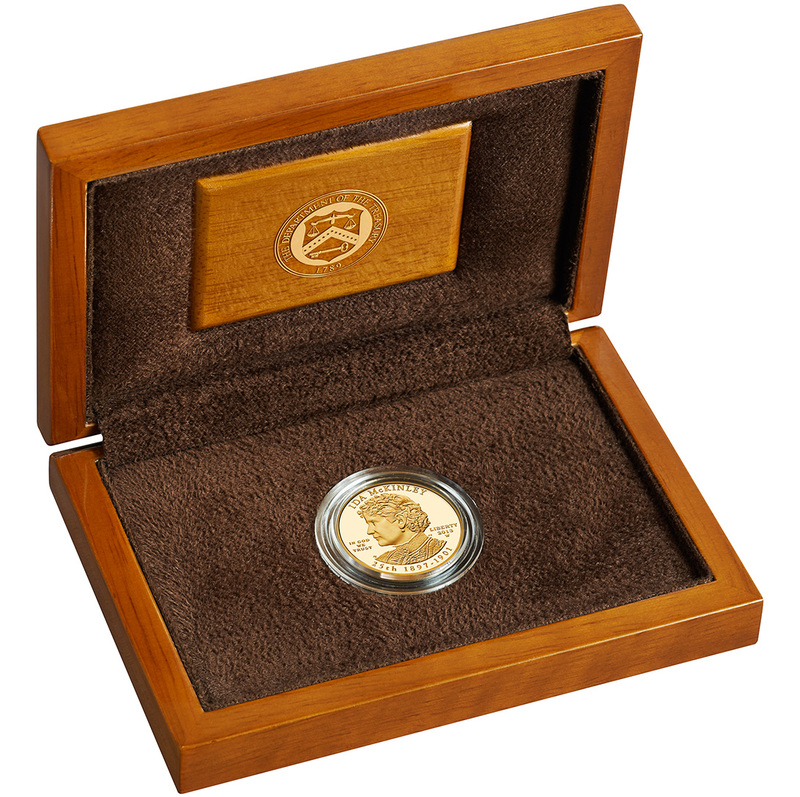 These coins are issued as the first 2013-dated release of the US Mint's First Spouse Gold Coin Program. The series debuted in 2007 and honors the spouses of the former Presidents of the United States in the order in which they served in office. 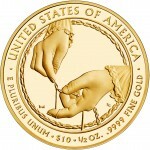 The Ida McKinley First Spouse Gold Coinsare featured in both proof and uncirculated conditions. Each is composed of one half ounce of .9999 fine gold. 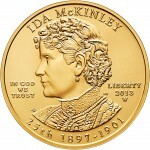 Shown on the obverse is a portrait of Ida McKinley as designed by United States Mint Artistic Infusion Program (AIP) Master Designer Susan Gamble with sculpting completed by United States Mint Sculptor-Engraver Phebe Hemphill. 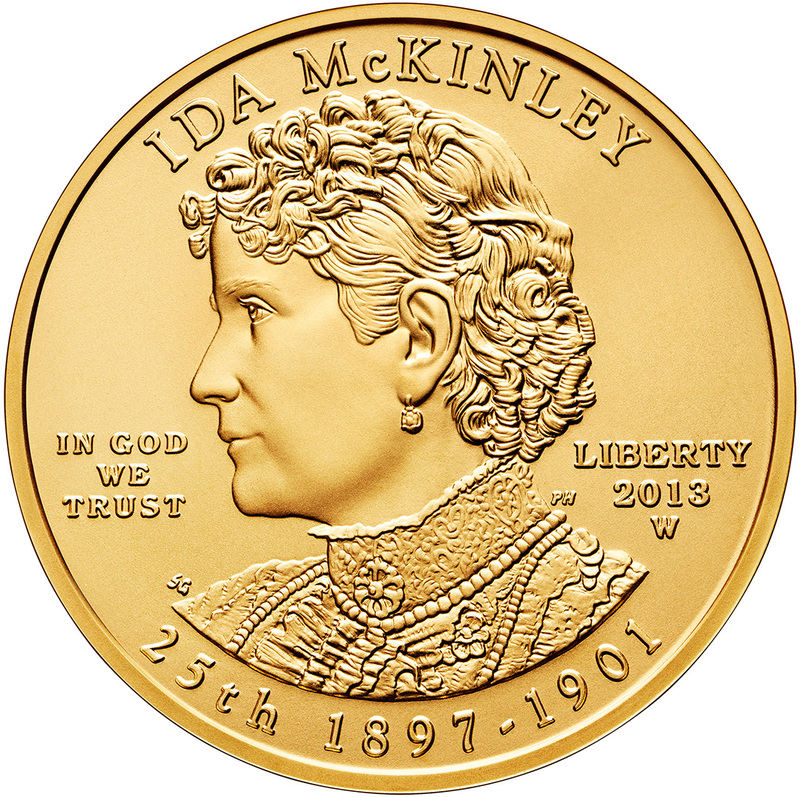 Inscriptions surrounding the portrait include "IDA MCKINLEY," "25TH," "1897-1901," "IN GOD WE TRUST," "LIBERTY," "2013" a "W" mintmark for West Point and the artist's initials. 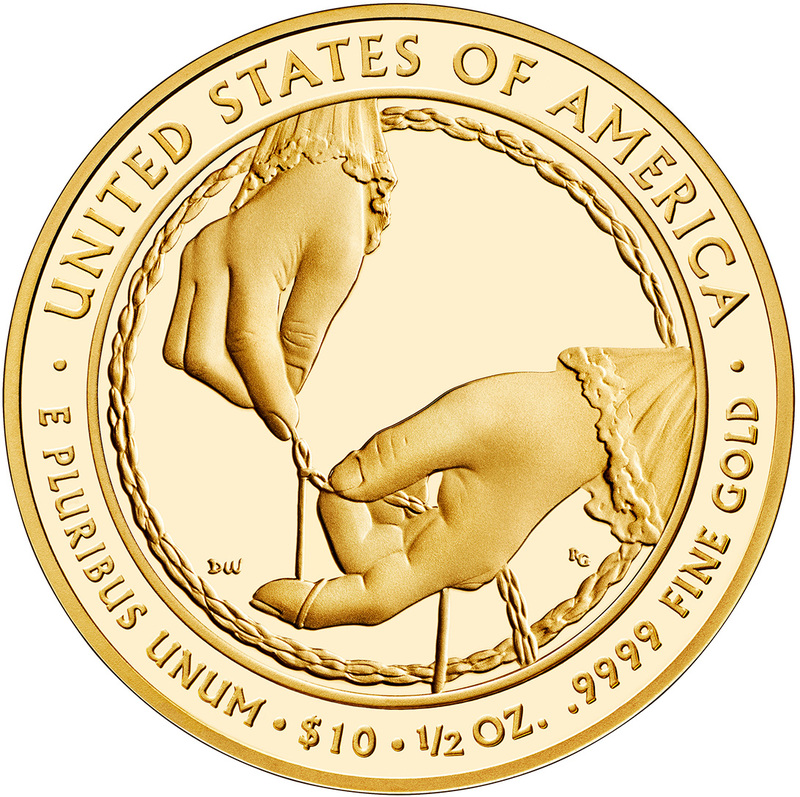 According to the US Mint, the reverse "Depicts two hands crocheting, representing Mrs. McKinley's work crocheting thousands of slippers that were auctioned off for charity." It was designed by AIP Master Designer Donna Weaver and sculpted by United States Mint Sculptor-Engraver Renata Gordon. Reverse inscriptions include "UNITED STATES OF AMERICA," "E PLURIBUS UNUM," "$10," "1/2 OZ.," and ".9999 FINE GOLD." The maximum mintage for the coin is set at 10,000across all product options. Final mintage will be determined by demand. Pricing of the coin is determined weekly based on a pricing matrix which links the price to fluctuations in the gold market. Each ships in a custom-designed, highly polished, dome-chested, lacquered hardwood presentation case. A certificate of authenticity is also included. The appearance of this series was delayed this year as the US Mint overcame production difficulties with the designs. Future 2013 releases include Edith Roosevelt Gold Coins, Helen Taft Gold Coins, Ellen Wilson Gold Coins and Edith Wilson Gold Coins. 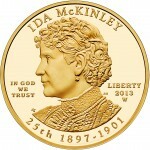 To order a 2013 Ida McKinley First Spouse Gold Coin, visit the US Mint's website at www.usmint.gov. Orders are also accepted by calling 1-800-USA-MINT (872-6468). Hearing- and speech-impaired customers with TTY equipment may order at 1-888-321-MINT (6468).